In English, students develop knowledge, skills and understanding about the English language and literature. When students engage in planned learning experiences they develop the ability to talk, listen, read, view and write with purpose, effect, and confidence. 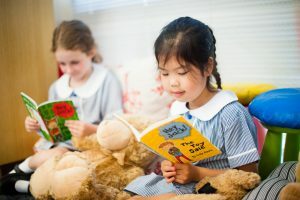 This Key Learning Area involves learning to read widely with understanding and for enjoyment, spelling accurately, writing grammatically in a variety of forms, listening and communication, critically assessing good literature and aspects of the media.